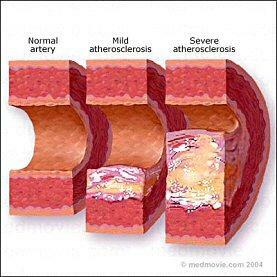 Atherosclerosis is the hardening and narrowing of the arteries. It is caused by the slow buildup of plaque on the inside of walls of the arteries. Arteries are blood vessels that carry oxygen-rich blood from the heart to other parts of the body. Atherosclerosis is a slow, progressive disease that may start in childhood. It can affect the arteries of the brain, heart, kidneys, arms and legs. Plaque is made up of fat, cholesterol, calcium, and other substances found in your blood. As it grows, the buildup of plaque narrows the inside of the artery and, in time, may restrict blood flow and even calcify. Once calcification occurs, the blockage and buildup can only be removed through surgery. Hard plaque causes artery walls to thicken and harden. Soft plaque is more likely to break apart from the walls and enter the bloodstream, which can cause blood clots that can partially or totally block the flow of blood in the artery. As plaque builds up, it can cause serious diseases and complications. These include, coronary artery diseases (Angina and Heart Attacks) and cerebrovascular disease (Strokes), which are the leading cause of death in the U.S.
Atherosclerosis usually does not cause symptoms until it severely narrows or totally blocks an artery. Therefore, it is usually diagnosed AFTER you develop complications. InSight Ultrasound Specialists will help you find out if you are developing vascular disease earlier than you should be for your actual age, and will also analyze and check for the type of plaque that should be closely monitored.